Model stitched on 14 Ct Cream Lyon Table Runner (#4001R) using DMC floss. Stitch count 432x136. This complete cross stitch kit includes 14 count Aida fabric, 100% cotton DMC embroidery floss, one needle, a large full color finished model picture and instructions. Finished Size: 33.5" x 10.5". 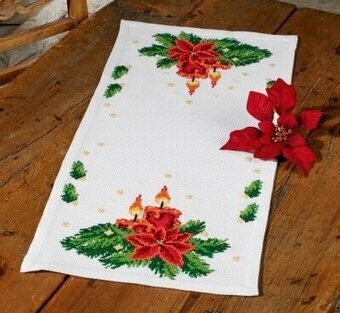 This stamped cross stitch kit features a 100% cotton, hemmed, inwoven border, table runner; 100% cotton DMC embroidery floss; needle; and instructions. Finished size is 16" x 40". Table runner pattern only for Christmas/Winter. 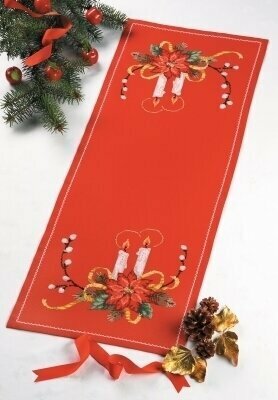 Christmas Table Runner (Poinsettias) stitched on Stitchworks Table Runner using DMC floss and Mill Hill beads 03049. Stitch count is 154W x 25H. 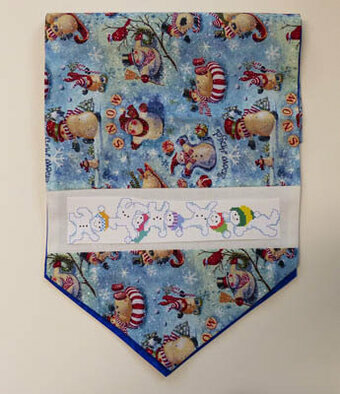 Winter Table Runner (Tumbling Snowmen) stitched on Stitchworks Table Runner using DMC floss and Kreinik Blending Filament. Stitch count is 131W x 28H. Cross Stitch Kit Includes: Fabric, pearl yarn, needles, and instructions. Size: 14.4" x 46.8". 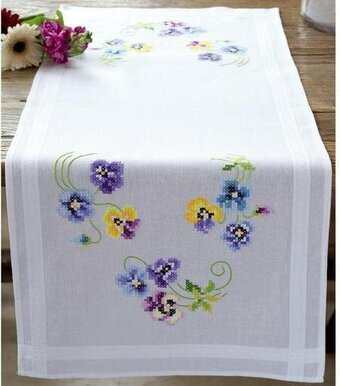 Fabric: Natural Linen. Count: 18ct. 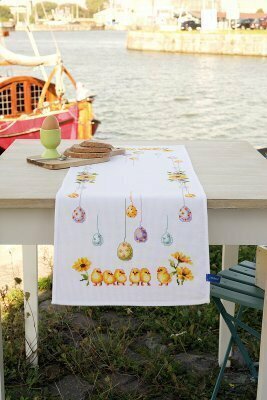 This cross stitch kit contains a 100% cotton, hemmed, inwoven border, table runner; 100% cotton DMC embroidery floss; needle; and instructions. Finished size is 16" x 40". 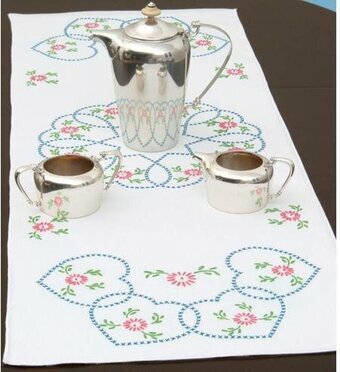 Kit includes 14 Ct. red Aida, pattern, floss, needle and instructions. 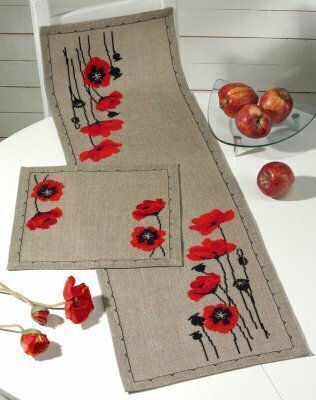 Finished size: 14" x 36.4"
Complete kit includes Pre-stamped white table runner, fabric, thread, needle and instructions. Finished size: 16" x 40". Kit includes 8 Ct. white Aida, pattern, floss, needle and instructions. Finished size: 14.4" x 31.2"
Complete kit includes printed runner with hemmed woven border 100% Cotton, threads, needle and instructions. Finished size: 16" x 40"
Model stitched on one 14 x 34 piece of 13 or 15 Ct. fabric using 80 yards of youy choice of color DMC floss. Each package contains one scarf of cotton/poly broadcloth, with a perle edged finish. Aproximate size: scarf - 14-1/2" x 41-1/2". Additional materials needed to complete: Hoop, needle, and floss. Floss requirements included. Floss NOT included.